We Believe Adult Edition – for teaching older teens and adults of all ages (9th grade reading level). We Believe Youth Edition – for teaching younger teens and older children (6th grade reading level). 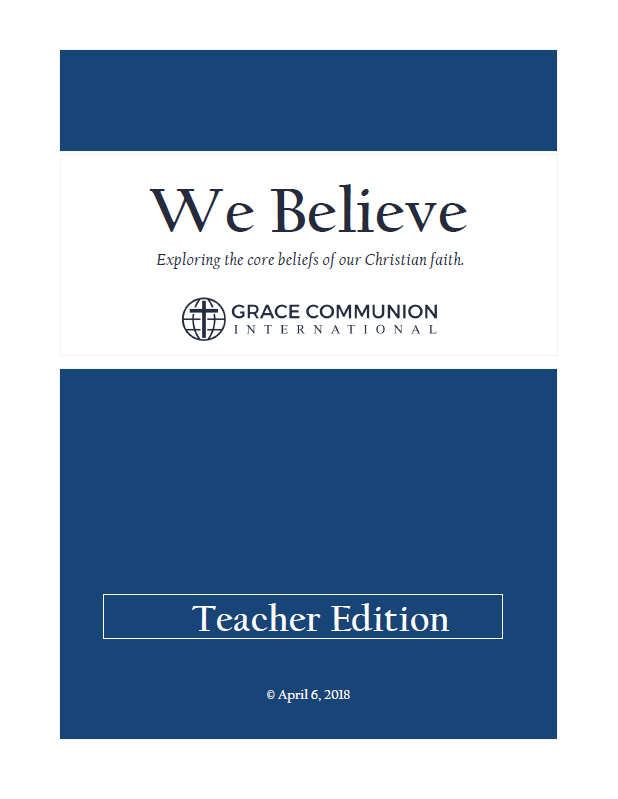 We Believe Teacher Edition – the Adult Edition plus teaching notes (the text is also reproduced below). In each section of We Believe, you will find bold face questions followed by answers in regular type. Following the answers are references to relevant verses in the Bible, given as links you can click to go to those verses online. There are multiple ways to use We Believe in teaching your students—you may adapt its use to your preferred teaching style, the needs of your students, and the setting of your class. However, in making these adaptations, we ask that you present the questions and answers as they are written. The language used is carefully crafted to be faithful to the Holy Scriptures, to be in harmony with Grace Communion International’s doctrine (summarized in The GCI Statement of Beliefs) and in harmony with GCI’s incarnational Trinitarian theology (summarized in The God Revealed in Jesus Christ). We encourage you to become familiar with these two booklets before teaching We Believe classes. Note that the text of The GCI Statement of Beliefs is reproduced in the Appendix of this document, and relevant sections are quoted in the Teaching Notes for ease of reference. Father, in the name of Jesus, we pray that those you have called and equipped to teach the core beliefs of our Christian faith using We Believe, will be led by the Holy Spirit to teach with faithfulness and accuracy the truth that you have given to the Church for all times. We pray that these teachers will experience Jesus’ joy in their teaching, and that their students will be edified and encouraged, all to the glory of your holy name. Amen. From the beginning, God’s human creatures, in distrusting God, have alienated themselves and sought to live autonomously from their good, faithful and life-giving Creator. But because the triune God is a faithful and loving God who does not give up on his creatures, God himself made a way for them to be reconciled to him and thus return to fullness of communion with him as their Lord and Savior. The Son of God is the second Person of the triune God, eternally begotten of the Father. He is the Word and the express image of the Father. The Father created all things through the Son, and the Son sustains all things by his word. He was sent by the Father to be God revealed in the flesh for our salvation, Jesus Christ. Jesus was conceived by the power of the Holy Spirit and born of the virgin Mary, fully God and fully human, two natures in one Person. He is the Son of God and Lord of all, worthy of worship, honor and reverence. As the prophesied Savior of humanity, he suffered and died for all human sin, was raised bodily from the dead, and ascended to heaven. Taking on our broken and alienated humanity, he has included the entire human race in his right relationship with the Father, so that in his regeneration of our humanity we share in his sonship, being adopted as God’s own children in the power of the Spirit. As our representative and substitute, he stands in for all humanity before the Father, providing the perfect human response to God on our behalf and reconciling humanity to the Father. He will come again in glory as King of kings over all nations. For an essay concerning God’s covenant with humanity (including the distinctions between the old and new covenants), see Covenant, Law and God’s Faithfulness. Because of the regeneration of human nature in Jesus, who is the new Head of humanity, the Holy Spirit is able to minister in a new and deeper way in the lives of all people so that they might share in the new human nature forged for them in Jesus Christ. The Holy Spirit thus works out in us what Christ has accomplished for us. By the Holy Spirit, we can share in the Son’s relationship of sonship with the Father, and so by grace become God’s adopted children who live in communion with the Father through the Son (Eph. 2:15). In the New Testament, our personally receiving and sharing in the Son’s communion with the Father is called union with Christ, or being in Christ, or being in the Lord. Through that union (which in GCI we refer to as the spiritual union) believers, in and by the Holy Spirit, share in what was accomplished by Jesus in the hypostatic union. The Holy Spirit thus acts and ministers on the basis of the hypostatic union to establish the spiritual union by which individuals personally respond and freely receive the freely-given gift of our salvation that, already, is complete in Christ. God created humanity male and female in the image and likeness of God. God blessed them, telling them to multiply and fill the earth. In love, the Lord gave humans stewardship over all the earth and its creatures. Typified by Adam who sinned, humanity lives in sin against its Creator, thus spreading suffering and death in the world. Despite human sinfulness, humanity continues in and is defined by having been created according to God’s image. Thus all humans, collectively and individually, deserve love, honor, and respect. The eternally perfect image of God is the Lord Jesus Christ, who is the last Adam. God creates through Jesus Christ the one new humanity over which sin and death have no power. In Christ, humanity bears perfectly the image of God, and in union with Christ, humanity is included in the relationship Christ has with the Father. We Believe now moves on to two sections that address what is often referred to as “Word and sacrament.” Word (Section 7) in this case refers to the written word of God, the Bible (the Holy Scriptures). Sacrament (Section 8) refers to the two sacraments of the Church—baptism and the Lord’s Supper (also called Communion and the Eucharist). Word and sacrament are principal ways by which the Church encounters and is nourished, through the Holy Spirit, by its Lord and Savior, Jesus Christ, the living Word of God. The Old Testament shows us God’s covenant promises revealed first to Abraham, then to Israel. The New Testament reveals to the renewed people of God (the Church), the ultimate fulfillment of those covenant promises. The Old Testament prepared the people of God to recognize and receive the fulfillment of God’s Word in Jesus Christ. It also shows how the people of God were to live by faith in the promises of God as Israel, a particular chosen people. The New Testament shows the church how to live by faith after the fulfillment of those promises by Jesus Christ and in hope of their ultimate consummation upon Christ’s bodily return. (Heb. 1:1-2; Gal. 3:24-25). The sacrament of baptism proclaims that we are saved by Christ alone and not through our own repentance and faith. It is a participation in the death and resurrection of Jesus Christ, in which our old selves have been crucified and renounced in Christ and we have been freed from the shackles of the past and given new being through his resurrection. Baptism proclaims the good news that Christ has made us his own, and that it is only in him that our new life of faith and obedience emerges. Grace Communion International baptizes by immersion. In the sacrament of the Lord’s Supper, we partake of bread and wine in remembrance of our Savior, proclaiming his death until he comes. The Lord’s Supper is a participation in the death and resurrection of our Lord. Just as the bread and wine become part of our physical bodies, so we are made by grace to partake spiritually of Jesus Christ in his body and blood. Thus the Lord’s Supper declares to believers that in every aspect of our Christian life we rely not on any obedience or righteousness of our own, but solely upon the grace of God incarnate in Jesus Christ. The gospel is the good news of the kingdom of God and salvation by God’s grace through faith in Jesus Christ. It is the message that Christ died for our sins and has made us his own before and apart from our believing in him and has bound us to himself by his love in such a way that he will never let us go. Therefore, he calls on all humans to repent and believe in him as Lord and Savior. Father, I confess my faults, shortcomings, sins, and rebellious acts, and ask you to forgive me. I embrace you, Lord Jesus, as my Savior and Lord. Thank you for your atoning death on the cross in obedience to your Father’s will to put away my sins. I enthrone you, Lord Jesus, to be in charge of every part of my life, and I ask you to indwell and empower me with your Holy Spirit, so that I may live as your faithful follower from now on. In Jesus name, amen. The Holy Spirit’s ministry is to set all free with the freedom won for them in Jesus Christ. But the biblical warnings require us to take seriously the almost impossible possibility that some people might somehow refuse the freedom the Spirit brings to them to surrender to the grace of God in Jesus Christ and receive all the benefits of living in a good and right worship relationship with God in which we receive his forgiveness by faith and accept his free gift of salvation daily and so live under his lordship. The limits to salvation, whatever they may be, are known only to God. Three truths above all are certain: 1) God is a holy God who is not to be trifled with, 2) no one will be saved except by grace alone, and 3) no judge could possibly be more gracious than our Lord and Savior, Jesus Christ. If some do manage to resist the Holy Spirit and reject God’s forgiveness and grace stored up for them in Jesus Christ, it will not be due to any lack or limits to God’s gracious provision made for all. God loves us with a perfect, freely given and eternally faithful love, establishing marriage as an exclusive and sacred union between one man and one woman to be a unique living witness that reflects and honors God’s covenant relationship with his people in Jesus Christ. The Bible teaches that the practice of homosexual behavior is a sin, as indicated by biblical prohibitions such as Rom. 1:26-27 and 1 Cor. 6:9. However, homosexual behavior is no more, or less, sinful than any other sin. All sinners are called to repentance and faith in Jesus Christ. Any sinner who comes to Christ finds repentance and forgiveness and is cleansed by the Holy Spirit of all his or her sins. Under the leadership of the Holy Spirit, the converted homosexual moves away from the gay lifestyle and enters into the new life in Christ. This does not necessarily mean that the homosexual becomes heterosexual. Rather, it means that, by the grace and power of God, he or she no longer engages in homosexual acts. Christians should accept redeemed homosexuals into fellowship just as they accept any forgiven sinner — thankful that God has extended his mercy and grace to all humanity. For a letter from GCI concerning LGBT issues click here. God judges all humans through Jesus Christ as those who belong to God through him. Therefore, all humans are, in spite of themselves, loved, forgiven, and included in Jesus Christ, who is their Lord and Savior. God’s love will never cease or diminish even for those who, denying the reality of who they are in him, refuse his love and consign themselves to hell; they will not enjoy the fruit of his salvation but rather will experience his love as wrath. God disciplines those he loves so that they will return to him and live; he stands at the door and knocks, urging them to open the door to his everlasting love. God’s judgment in Christ means the ultimate end of evil and the renewal of the earth and all creation. Hell is the spiritual alienation from God chosen by incorrigible sinners. In the New Testament, hell is referred to by the terms “lake of fire,” “darkness,” and Gehenna (a gorge outside Jerusalem where garbage was burned). Hell is characterized by punishment, torment, anguish, weeping and gnashing of teeth, and eternal destruction. The biblical terms Sheol and Hades, often translated “hell” or “the grave,” refer to the realm of the dead (2 Thess. 1:8-9; Matt. 10:28; 25:41, 46; Rev. 20:14-15; 21:8; Matt.13:42; Ps. 49:14-15). Christians vary in their interpretation of the relevant biblical passages, and our members are no exception. Some passages seem to suggest an unconscious state (see Ps. 6:5; 13:3; 146:3-4; Eccl. 3:19-21; John 11:11-14; Acts 13:36) but the Scriptural evidence for some form of a conscious state is strong (see Phil. 1:21-24; 1 Thess. 4:13-14, Rev. 6:9-11). Certainly, the body dies and decays, but these passages indicate that the spirit, or soul, of believers is consciously present with God. Whichever view is correct, the one thing we can know for certain is that the dead are safe in God’s hands, awaiting the resurrection. For a related GCI article, see What About the Intermediate State?